There's A Rat In My Toilet What Am I Going To Do? Lindsey There's A Rat In My Toilet What Am I Going To Do? Being attacked from the rear when one's rear is most exposed, by something from the mysterious depths of the lavvy u-bend is a fear universally played on. Remember Arachnophobia? Heard of New York's sewer alligators? Pity Deptford's Maxine Killingback, then, who was distracted from the job in hand by the frantic scufflings and splashings of an unfortunate rat in her toilet bowl. Ms Killingback has rheumatism in her legs and back and couldn't move quickly enough to prevent the misadventurous rodent biting her as she struggled from the seat. Despite Ms Killingback's disability and unfortunate surname she manfully struggled to repel the critter, forcing it down the u-bend with a plunger and a bottle of bleach, until it was a drowned rat. A panicked phonecall to Greenwich Council revealed that they did not class a toilet-based incidence of rat invasion as an emergency so the bitten and distressed rodent murderer barricaded up her lav with packets of washing powder and escaped to the safety of her partner's house in Woolwich. 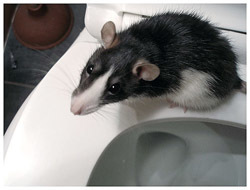 For more discussion on practical ways to deal with rats in toilet bowls join the discussion here. Alternatively, those who are now freaked out about visiting the smallest room solo, might wish to invest in this reassuring new invention - the TwoDaLoo. After all, there's safety in numbers. Image courtesy of Big Fat Rat's Flickrstream. And UB40 RIP.